Warner Bros.' highly-anticipated Aquaman movie starts production this summer, and will continue through the fall, with a shoot in Italy planned. Fans have been waiting for more updates on this highly-anticipated superhero adventure. Last month, a video surfaced showing some of Jason Momoa's training to play the title character, a.k.a. Arthur Curry, but he isn't the only cast member who's been getting ready. Earlier today, Amber Heard, who is playing the role of Mera, revealed on social media that that she has been partaking in some wushu classes. 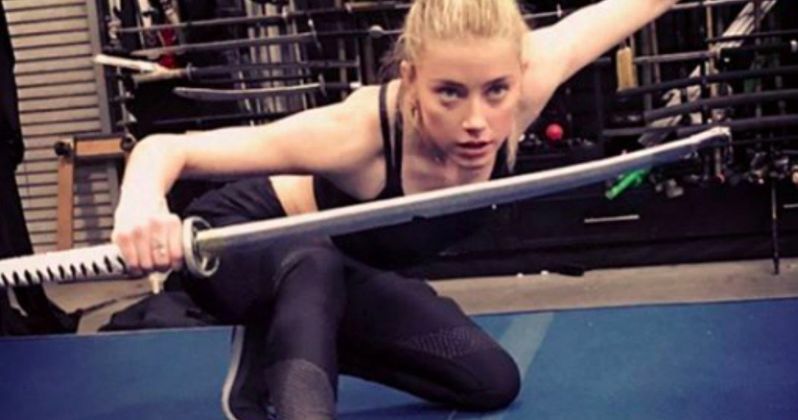 Amber Heard posted a photo on Instagram, which shows the actress practicing with a fake sword. The actress also revealed in her Instagram post that she is being trained by accomplished martial artist Li Jing, who has worked as a stuntwoman on big-budget movies such as Pacific Rim, The Last Airbender, Rush Hour 3 and The Fast and the Furious: Tokyo Drift, just to name a few. Amber Heard didn't reveal any further details about her training, or how much training she still has left before production begins. We reported earlier this month that Warner Bros.' has pushed the Aquaman release date from October 5, 2018 to December 21, 2018, which comes just a few months after it was pushed from July 27, 2018 to October 5, 2018. No explanation was given for the release date shift, and it remains to be seen if this will affect the shooting schedule, but it's possible that this move was made to give director James Wan more time in post-production. If that is in fact the case, then production may still be slated to begin this summer. Aquaman will now go up against Sony's animated Spider-Man movie in its new release date. Aquaman also stars Willem Dafoe as Nuidis Vulko, Patrick Wilson as Ocean Master Orm, Nicole Kidman as Aquaman's mother, Atlanna and Yahya Abdul Mateen II as the main villain, Black Manta. There have been reports that the production is eyeing Temeura Morrison to play Arthur Curry's human father, but it hasn't been confirmed if he has signed on quite yet. No story details have surfaced, but director James Wan has compared this story to the adventure classic Romancing the Stone, teasing that both Aquaman and Mera don't exactly get along too well when they first meet. James Wan, who is directing from a script by Will Beall, based on a story that the director came up with alongside Geoff Johns, has also confirmed that the DC Comics character Aqualad will not show up in the Aquaman movie. Jason Momoa recently praised the script, making a bold statement that Aquaman will show fans a world they've never seen before. Fans will get to see both Aquaman and Mera in the highly-anticipated Justice League movie, which hits theaters on November 17. As we get closer and closer to production starting on Aquaman, take a look at this new photo from Amber Heard's recent wushu training session.